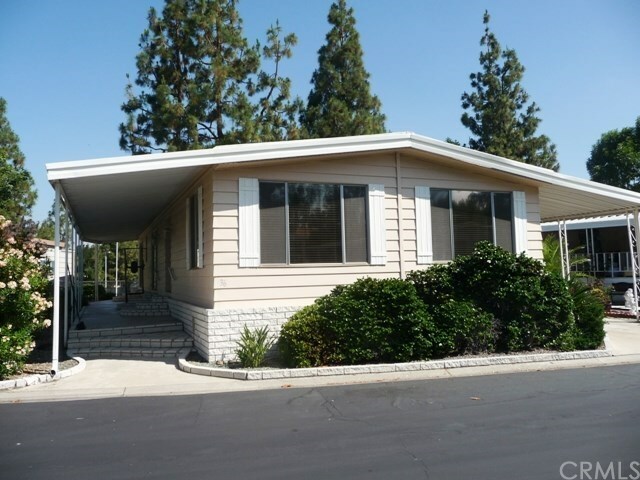 Located in one of Orange County's most prestigious manufactured housing communities! The home is set on a large "pie"-shaped lot and offers privacy on the side and backs up to the greenbelt and tennis court. The front of the home, the side porch and steps to the front door and two sliding glass doors are all done in cement and brick. When you enter the home, you will notice a large living/dining room area, the newly painted walls, and nice faux wood blinds. The kitchen features white cabinetry, including a dishwasher, large pantry and unique space for the microwave and toaster oven, gas cook-top, newer sink and faucet. Refrigerator and newer Washer + Dryer can stay with the home. You can let the breeze flow through the sliding door in the den. The large master bedroom suite offers a walk-in closet, a soaking bathtub is waiting to sooth away the cares of the day, two sinks, linen storage and a slider to the side yard. Nice 2nd bedroom and guest bathroom with step-in shower. Newer flooring, including Berber carpeting, throughout. Central Air Conditioning, Storage Shed, Ceiling fan, and easy to maintain landscaping. Directions: 5 FWY, exit east on Lake Forest exit. Turn left on Muirlands. Turn right into park entrance.